Francis Drake was the son of a Tenant Farmer and Protestant Preacher on the Crowndale Estate of Lord Francis Russell, Second Earl of Bedford. Within family and then went to sea at age of thirteen. 1553? : Works on coastal ships. 1565: Francis Drake now engaged in longer voyages to Guinea and the Spanish Main. 1567: Took command of the ship “The Judith” and went with Sir John Hawkins to the Gulf of Mexico but the expedition was not a success. 1571: Sailed on to the West Indies to try and recoup his losses which he had made to the Spaniards. 1572: He gained a privateer’s licence from Queen Elizabeth the First and sailed with two small ships the “Pasha” and the “Swan” and plundered Spanish ships of Pananma. He became a legend back in England. It is said he was the first Englishman to see the Pacific Ocean. 1573: Francis Drake returned to Plymouth a hero. 1577: Set out with five ships to explore the Strait of Magellan. 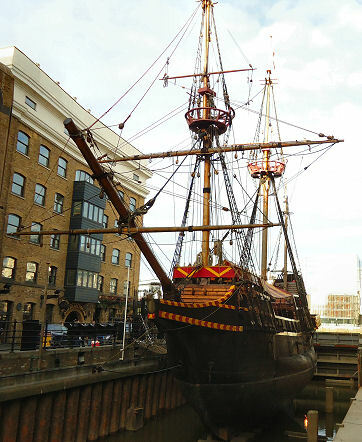 He changed his ship’s name en route to “The Golden Hind”. After tremendous storms in which one ship the “Marigold” was lost and one “The Elizabeth ” was forced to return home he sailed alone northward to Vancouver but failed to find a North West passage into the Atlantic. He turned South again and sailed across the Pacific for 68 days without sighting land. Made his first landfall in Java. 1580: (September) Finally reached England once more via the Cape of Good Hope and was hailed as the first Englishman to circumnavigate the world. Queen Elizabeth visited him at Deptford despite Spanish Protests and gave him a knighthood. 1585: Sailed again to plunder Hispaniola and the Coast of Florida. He brought home with him some dispirited colonists as well as potatoes and tobacco. 1587: Francis Drake pillaged the Spanish port of Cadiz. 1589: He sailed to aid the Portuguese against Spain but was unsuccessful. 1596: Was taken ill on an expedition with Sir John Hawkins to the West Indies. 1. July 4, 1569: To Mary Newman, who was buried January 25, 1582-3, in Saint Bordeaux. 2. Elizabeth, daughter and heiress of Sir George Sydenham of Combe Sydenham, Somerset. 28th January 1596, Died at sea off Puerta Bella, Panama. Buckland Abbey, Yelverton, PL2 0EY. (treasures). The Golden Hinde Educational Museum, Saint Mary’s Over Dock, Cathedral Street, Southwark. Combe Sydenham Country Park, Monksilver, Taunton, TA4 4JG.